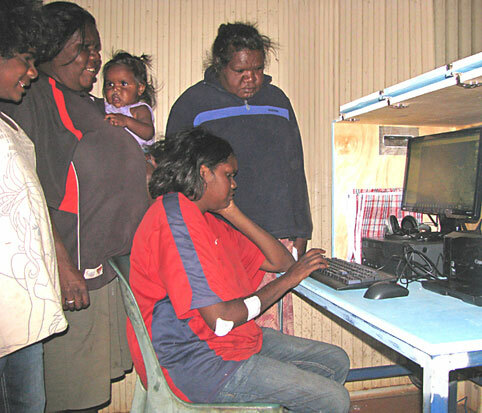 When it comes to using computers people in the most remote outback of Australia have a lot of catching up to do. Of 45 people interviewed in three communities, only 6% had a computer at home, and only 1% had internet access at home. “This makes take-up an issue,” observe the Centre for Appropriate Technology (CAT), Swinburne University and Central Land Council who have just released a study. They surveyed Kwale Kwale, Mungalawurru and Imangara outstations, all in Central Australia. Major findings included social and cultural issues surrounding take-up. Barriers include affordability, cost, billing, lack of computer skills, general knowledge and maintenance. “Aboriginal people participated in the research are keen to gain Internet access and use this at home, but need more training and education on how to use the Internet and computers,” the survey found. Pictured from left at Mungalawurru are Rosita (visitor), Esmeralda with Karen’s new daughter, Karen and Cynthia.